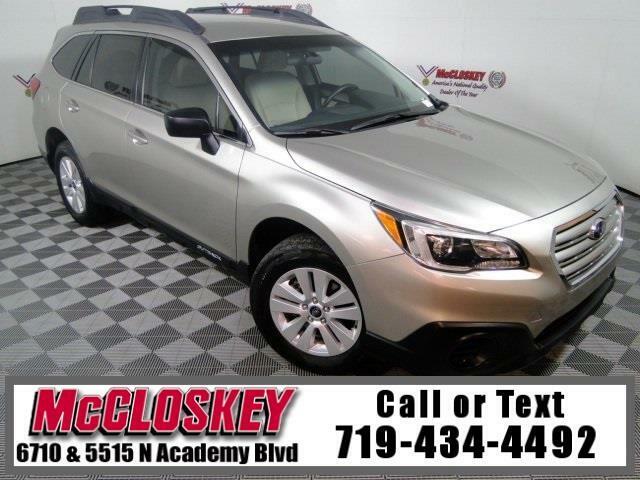 Stylish and immaculate 2017 Subaru Outback 2.5i All Wheel Drive with Keyless Entry, Backup Camera, Premium Sound System, AUX and USB Connections, and Premium Wheels! The 2.5i starts with a 2.5-liter four-cylinder engine (175 horsepower, 174 pound-feet of torque) and a continuously variable transmission (CVT) that feeds power to all four wheels. Standard features include 17-inch alloy wheels, hill descent control, hill holding assist, automatic headlights, a rearview camera, roof rails (with integrated cross bars), air-conditioning, a tilt-and-telescoping steering wheel, a height-adjustable driver seat, a 60/40-split folding rear seat, Bluetooth connectivity, Subaru's Starlink 6.2-inch touchscreen interface, and a four-speaker sound system with a CD player, an auxiliary audio jack, a USB-iPod interface and various smartphone-integration apps.